Up until now the rewards of reaching your fitness goals (apart from getting fitter, of course) have been rather intangible and limited to a taptic buzz on the wrist from your Apple Watch or the opportunity to taunt one of your mates' step counts on Fitbit. That's beginning to change as the links between wearables, fitness and financial rewards become clearer. A 2016 study from Duke-NUS Medical School in Singapore divided 800 people, aged 21 to 65, into four groups and "identified no evidence of improved health outcomes". It made plenty of column inches in the papers. We jumped on the study and looked at how, if you overlooked the "chocolate teapot" headlines and dug a little deeper down, you would find that there was proof of the long-term health gains that fitness wearables can provide. And there was another nugget that got lost in the noise declaring the endgame for trackers, which offered an intriguing glimpse into an alternative future - one where the motivating rewards are not just physiological but financial. Of the four groups analysed in the study, it was only the one that had been incentivised with cash rewards that offered any improvement in physical gains after six months. The mean daily step count among wearers in this greedy group was 11,010 steps, compared to 9,280 in the group rewarded with charitable donations, and 8,550 in the group that simply got by wearing a Zip. Eventually, the cash group was eclipsed by the others and fell away after twelve months, however here, for the first time, was evidence that there is a relationship between wearable devices, monetary reward and fitness and health boosts. It's a concept that health insurer Vitality is already exploring. The company's Active Rewards benefit, aims to harness their members' personal ownership of wearables to understand and reward health behaviours. Free cinema tickets and Starbucks can be earned by hitting step goals (12,500 in a day will either get you in to see Tom Cruise or a Latte) while hitting a Virgin Active Gym, finishing a Park Run, or logging over 30 minutes at 60% max heart rate all count towards bigger kickbacks, like 40% on British Airways return flights in Europe. The Vitality programme has come a long way since it first offered rewards for pedometer usage in 2006 and it has now rolled out a partnership with Apple and a discounted Series 2 that's dependent on activity levels. 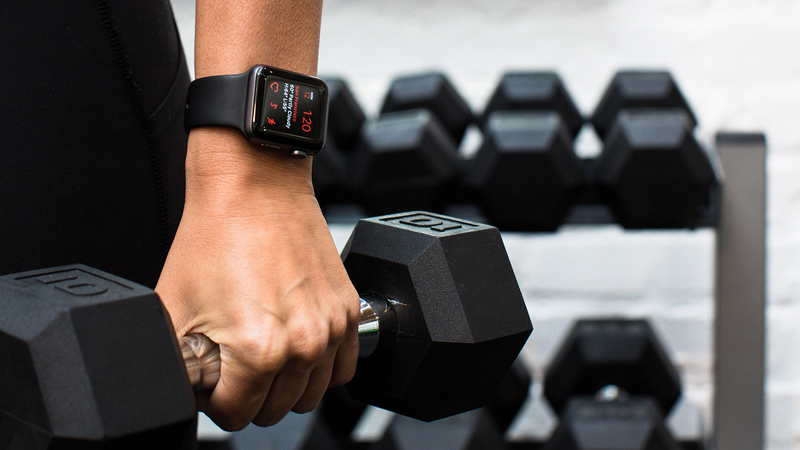 Although the Apple tie up is their most high profile, the company has also partnered with Fitbug, Misfit, Moves, Polar, Garmin and Fitbit too, accepting HR data from the last three. And the company says it's working. Some 34% of 'sedentary' users have started to register activity and there's been a six fold increase in the number of members hitting the weekly activity thresholds. "Our core purpose is to encourage people to lead healthier lives and we reward people for doing so," says Nick Read, commercial director at Vitality. "The data we obtain allows us to look at the intensity of a workout as well as its distance or duration and we can see which rewards give members the most encouragement to get active, and we can adapt our programme accordingly." According to Vitality, Active Rewards has had a profound effect in two areas. "Firstly, it has encouraged members who were not previously engaged in physical activity to become engaged and it motivates those who are already engaged to do more," adds Read. The business model is clear. The closed loop that encourages positive behaviour in members, then reduces risk for the company and brings premiums down, which then provides funding to change behaviour further.And it'sclearly an idea that has room to breathe asrecent Deloitte research revealed four out of 10UK health insurance customers would consider using a wearable to allow an insurance company access to their health and fitness data for the most accurate premium. However, there is potential to game the system. For example, someone could decide to "lend" their Series 2 to their triathlete partner or have "mislaid" their Fitbit only to find it a week later on their highly energised 12-year-old and still reap the rewards. However, they would also be putting themselves at risk of insurance fraud. Similarly, there are flaws from the consumer angle as Vitality are at liberty to change which wearables they support and make revisions to the Vitality points system. This happened in South Africa,where Vitality's parent company, Discovery, increased the vigorous physical activity needed to earn 300 points from 20 to 59 minutes at 70% age-related max HR, and 30 to 89 minutes at 80% of age-related max HR. So, if you really wanted those points, you'd really have to make some changes to your effort and some Discovery members questioned at what point encouraging positive behaviour slips into controlling behaviour. Discovery Vitality's CEO Dr Shrey Viranna countered that the changes weren't drastic. "We are moving towards more verifiable [data] and we are refining heart rates towards a more clinical relevant dataset," he said. "I can understand why somebody may be aggrieved that the benefit is changing, but if our underlying premise and principle is about shifting and encouraging behaviour then you would understand that inherently in that there has to be change." In the UK, Vitality claim they have developed a proprietary science around incentive design in insurance. "The incentive set needs to be broad, and appeal to a number of different behavioural motivators, and be tied to clinical data to ensure that the targets set lead to significant improvements in the health of our members," says Read. "We continuously monitor medical developments to ensure that our metrics are clinically relevant and we have no current plans to revise how we award points for heart rate measurements." That's good news for current Vitality customers. However, the potential to change behaviour isn't confined to insurance premiums or the cost of your pumpkin spiced latte - the concept of FitCoin seeks to turn sweat into cryptocurrency. It has been around for over a year, although a hard launch is still to be seen. The app syncs and pulls workout data from your tracker, which is then equated to CPU mining time and a number of bitcoins assigned to a virtual wallet. It was the brainchild of the creative technologists at Chaotic Moon - recently acquired by Accenture, who have clearly seen some future in the concept of rewarding an individual's fitness data. But getting hold of that data and verifying it is the issue that has, seemingly,delayed FitCoin and led Vitality to occasionally move the goalposts of their rewards system. Going forward, increased API access from wearable tech manufacturers and app developers will be crucial so that third party, money-making services can be bolted on.Then, once a company has easy access to verified data all they need do is apply an algorithm and, hey presto, you get paid. For example, if your occupation is a physical one, a member of the emergency services, perhaps, the logic is that the fitter you are, the better you will be able to perform your duties. Verifiable proof that your PBs are getting better over time, or your cardio health is improving, can inform your next salary review and strengthen your claims for a bigger pay day at the end of the month. Before we get there, though, we need to return to the study we mentioned at the outset because it's clear that one of the thorniest problems facing fitness wearable manufacturers is finding ways to keep people engaged. Financial savings, cryptocurrency and cold, hard cash might just be the motivators that they are looking for. However, bulletproofing the system against abuse and verifying data means the technology has to work hard now to catch up with the concept.